How to find the best thermal insulation for your home? What is a thermal curtain? How does the Moondream® thermal curtain work? Can I cut and hem my Moondream® thermal curtains? Can I hang my Moondream® thermal curtains close to a radiator? Can I use my Moondream® thermal curtains outside on my balcony or terrace? Can I hang up my Moondream® thermal curtain in the staircase? Can I sew your Moondream® thermal curtain on the back of my personal curtains? What is a difference between a thermal curtain and a thermal sheer? Is it possible to have a thermal curtain that also blocks the light? Do the thermal insulation curtains have a limited life? What are thermal curtains made of? What is the best thermal curtain lining? Can thermal curtains be washed? Can thermal insulation curtains be ironed? Do you have thermal door curtains with eyelet heading? Do you have thermal curtains made to measure? What is the best thermal curtain for a kitchen? Living room? Room? Child room? 1 - What is a thermal curtain? A thermal curtain is a curtain that insulates a room against the outside temperatures. As you may already know, if you hang a heavy fabric in front of your window, the cold gets “trapped” behind the fabric. The point of a thermal curtain is to have your home protected from the outside temperatures all year round. 2 - How does the Moondream® thermal curtain work? We found that the only way to create a really effective thermal insulation curtain was to reflect the heat rays. This innovative insulation solution developed by Moondream® is capable of lowering indoor temperatures by several degrees in summer, and save 46% on your energy bill in winter. 3 - Can I cut and hem my Moondream® thermal curtains? On purpose all our thermal curtains come with an overcast seam. All of our Moondream® curtains are delivered with an iron-on hemming tape enabling you to easily adjust the dimensions of your curtains to fit your windows. This video explains how to do it. We also recommend to simply sew a few stitches on the ends of the adhesive strip, so it does not detach from the curtain as we must make you aware that sometimes with excessive heat, the glue on the strip is not strong enough and the strip can come off. Unfortunately we are unable to use stronger glue on the strip because it will damage the fabric. If you think you really need to cut the multi-layered thermal curtain when shortening it, please do it carefully. 4 - Can I hang my Moondream® thermal curtains close to a radiator? 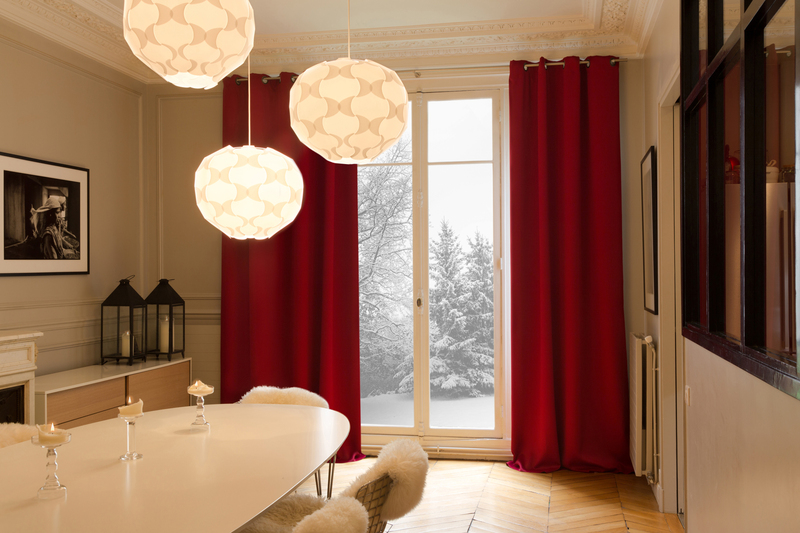 The goal of our Moondream® thermal curtain is to reflect the heat inside the room in winter. Hanging your curtain in front of a heater doesn’t make sense because you keep the heat between the back of the curtain and the window. Furthermore, it is not recommended to hang them in front of a radiator, as this could be dangerous as the fabric is not treated to be fire-retardant. 5 - Can I use my Moondream® thermal curtains outside on my balcony or terrace? The thermal curtain is not treated to resist to the sun, rain or cold. If you use it outside the curtain will get wet when it rains and the fabric will be faded by the sun. If you still want to use them in a sunny or rainy area, please consider to treat them beforehand with a fabric protector spray. Moondream® also offers a range of outdoor curtains that offer a protection against sun, wind and rain. Their fabric has been developed to resist any impact by water and light, so you can use them outside on your balcony, terrace or patio. 6 - Can I hang up my Moondream® thermal curtain in the staircase? Absolutely you can hang the curtain in a hallway or in the staircase. Keep in mind you’ll improve the results if you hang the curtain directly on the ceiling. With this kind of curtain you’ll get a blackout as well as a thermal effect. Please see our blackout curtain buying guide for more information. 7 - Can I sew your Moondream® thermal curtain on the back of my personal curtains? Theorically there is no objection but it is not necessary. Moondream® offers special thermal linings that can be attached on the back of your own curtains. They use the same “survival blanket concept” as the thermal curtains and deliver the same results: keeping the heat inside in winter time and reflect the heat to stay outside in summer time. 8 - What is a difference between a thermal curtain and a thermal sheer? The main difference is the fabric, the performances stay the same. With our thermal sheers the daylight comes through the window and it is not completely blocked out. 9 - Is it possible to have a thermal curtain that also blocks the light? Absolutely, but it has to be embedded with a blackout fabric. We carry this kind of blackout and thermal curtains in our webstore. 10 - Do the thermal insulation curtains have a limited life? Our thermal curtains have the same life span as any other premium quality curtain. 11 - What are thermal curtains made of? The Moondream® thermal curtains are made with 2 layers that are embedded. The first layer is a dim-out, blackout or sheer fabric. The second layer is a special lining that works the same way as a “survival blanket” does - the fabric is metallized with a special process to preserve the flow of the fabric and not make it stiff. Inspired by nanotechnologies, Moondream® has become the first ever company to industrially metallized fabric by injecting microscopic aluminum particles into woven thread. In addition to being truly soft to the touch, this type of fabric also offers a thermal performance comparable to one found in emergency blankets or astronaut suits. 12 - What is the best thermal curtain lining? Because it is very difficult to stop the cold, Moondream® decided to find another way to keep you warm in winter and avoid the summer heat. We developed a special fabric that works just like a survival blanket does: it reflects the heat inside the room in winter and blocks out the heat in summer. The Moondream® thermal fabric is also patent pending (French patent number 09 03899 / European patent number 2462274). 13 - Can thermal curtains be washed? Theoretically it could be but we do not recommend it because the wringing or spin drying will create some permanent creases on the fabric and could potentially damage it. 14 - Can thermal insulation curtains be ironed? They can be ironed, but only with a very low temperature. 15 - Are thermal curtains heavy? 16 - Do you have thermal door curtains with eyelet heading? Absolutely, most of our curtains are made with eyelets. One of the specific features of all Moondream® curtains is even to reinforce the top eyelet section - done without stitching - to provide a flawless overall appearance. The inner diameter of our eyelet is 1.6 inch, and the eyelet is rust proof. 17 - Do you offer made to measure thermal curtains? Currently no, but we carry 4 different lengths: 63”, 84”, 95” and 108”. Furthermore, our curtains are not hemmed on purpose. All of our curtains are delivered with an iron-on hemming tape enabling you to adjust the dimensions of your curtains to fit your windows. It’s a really easy process as you can see in this video. 18 - What is the best thermal curtain for a kitchen? Living room? Room? Kids room? Which model you should choose depends on how you would like to use it: If you need the daylight to come through, choose our thermal sheers. If you need to keep the light out, get our thermal and blackout curtains.